bJoining the Women’s March, held in London on January 19, was more than an exciting experience. It signified the coming together of diverse voices seeking the same progress and I count myself fortunate to be a part of this movement. Have You Heard About the Exciting News About the Equal Rights Amendment (ERA)? 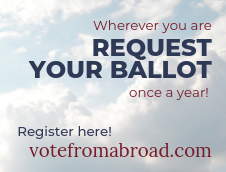 Get Broad Insights, our monthly newsletter, and stay up to date with our upcoming events, members blog, political action & more! 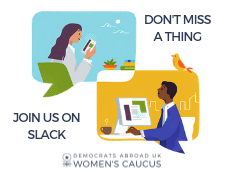 As a caucus of the Democrats Abroad UK, we are a team of fun & fearless women who advocate for women’s issues, promote female Democratic candidates and mobilize the voting power of the US community abroad. 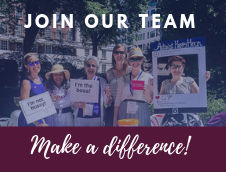 Focused on action and community, we seek to harness the passion and power of Democratic women living in the UK to make a difference in US politics, on Election Day and every day. The posting of content on this website does not constitute an endorsement of any views by DAUK, Democrats Abroad or the Democratic Party. Links to other organizations or publications imply neither endorsement of their policies nor any association with the Democratic Party or Democrats Abroad – UK. Be the first to hear about events, news & more.